At The Potters Barn we have over 35 years experience in making pottery and are passionate about teaching it. 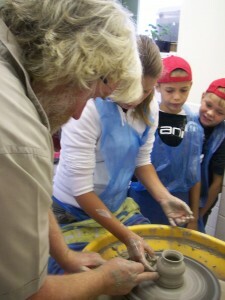 We provid creative clay group visits to a wide range of clients that are also very popular with all age groups. You have a choice of activities to try during your group visits with the skills suited to the age group. Visits are suitable for all sorts of clubs, groups, schools and parties with the activities taking place in one of our studio workshops chosen for the groups size and abilities. We welcome the opportunity to work with clubs and groups like the cubs, scouts, brownies, guides and WI to name but a few. Group visits to the pottery can be as short as one hour or all day in length. The choice of activity is up to you and we will advise what would be suitable if you wish. The Potters Barn is lucky to be located in the heart of the beautiful Cheshire countryside. It is also next to the historic Trent and Mersey canal. We are within easy reach of junction 17 on the M6 motorway at Sandbach. We are happy to tailor a visit to suit your requirements and can accommodate various budgets. If you are unable to come to The Potters Barn because of transport problems we can bring one to you.